These are superb specimens of Siak and Jambi. I'm trying to learn to read them too. Some of the commonly used references are not 100% accurate. 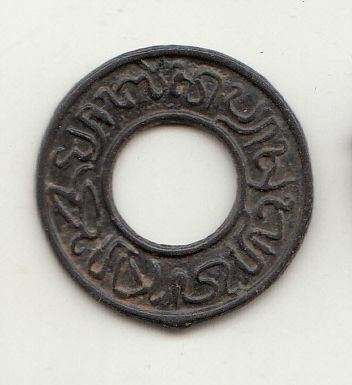 Coin 3 here reads backwards "Sultan Anum Sr(i) Ingalaga". It is from Jambi. The inscription is the sultan's title from the period 1743-90. Shown is the inscription reading the correct direction. Coin 5 begins Sultan Sri... but after that there is no agreement what it says. Millies reads J-M-B for Jambi. Number 4 reads in Javanese: Chap Sultan Jambi. This is an extraordinarily clear-reading specimen. The inscription starts exactly at the top, reads upright and clockwise. Coin 1 is Millies 154. It reds 'Sultan Siyak'. If you have a paper copy of Millies, could you have a look at this thread? Peter, I have to use the on-screen version of Millies. As you know it is very difficult to match a screen view to another screen view. That in any case is not an area I am familiar with. Ask me about imitations of Chinese cash from that region. Regarding the 5 coins posted on this thread, all but one are difficult to obtain, and extraordinary specimens of their types. Number 5 has a variant spelling of the final word in its inscription, probably an error. We still can't figure out what that word means. Mitchiner reads it from Millies illustrations, not even having a specimen to look at! He picked the specimen in Millies which is missing a syllable, to get it to say what he wanted it to. Coin 1 is now posted at Zeno, the first. It is Millies 154, but reads better, and has every diacritical mark in place. Millies points out they are missing on his only legible specimen. Coin 2 is also not known to Mitchiner. It is a clearly-written version, which has to be called the prototype of the now-common Siak(maybe) pitis with hexagonal center hole. The common coins are illiterately blundered. Problem is that the well-written one still gives no certain reading. It can be "Sultan Siyak", as Mitchiner reads the crude ones, or "Sri Pangeran Ratou", with Sri in place of Su. 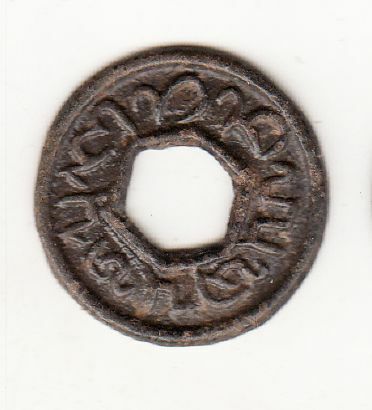 Coin 4 is a difficult one to obtain but the type reads clearly. I have a pair of nice ones fused back to back. They read slightly differently from each other, both missing either one letter, or a part of one. The coin posted here is perfect. 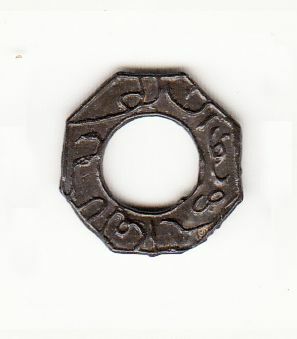 It reads in Javanese "Sultan Siyak". This is a difficult coin to find. I do not have one. 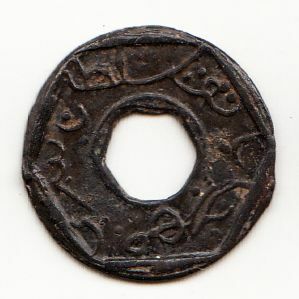 Coin 5, a Malaysian coin site says it reads Sultan Sri Maharaja Batu. The lettering for that would be right but missing a letter A in the syllable ra. 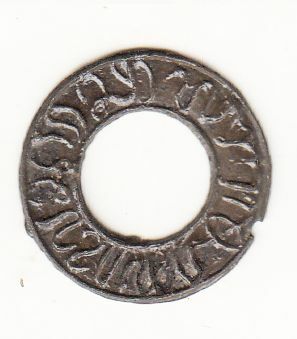 Note your coin has extra dots at the end making it read Batut. Batu means a stone, which makes no sense, besides maharaja makes no sense. Another way to read it is Sultan Sri Mohor Jabatu. I think that is a contraction of Mohor Jabat tu which would mean seal of his hand. In Malay Jabatan means an office or agency. Jabat is a root word for hand. Another variant spelling ends the word in Jaban. It is Jambi, middle 1700's but not known which sultan in that time of quasi-anarchy.